Some of the senior members of Caithness Tora-Kai karate club recently attended the International Traditional Karate Federation summer course at Heriot Watt University in Edinburgh. This annual event has been attended by Caithness exponents for the past 20 years. The Japanese instructors present this year were Senseis Kawasoe, Tsuyama and Naito teaching all aspects of karate during the 4 day course. On saturday 23rd August a grading was held where course members could progress through the Dan ranking system. 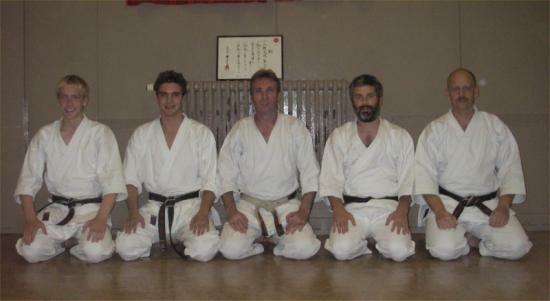 Local men Bob Silverwood and Sandy Wilson successfully passed their 2nd (nidan) Dan test. Club instructor Michael Tait passed the examination for 4th (yondan) Dan, in which he had to fight English, Irish, Latvian and Maltese opponents. Pictured are Michael Bob and Sandy along with David Nicol and Rob Silverwood who passed their 2nd Dan grading in Barrhead, Paisley in March this year.